The best way to get a following online is to use Twitter. 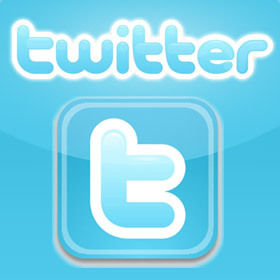 Twitter is a social media website that can also be used by businesses to release "tweets", or short status updates. These tweets are much shorter than blog posts, but come more frequently than blog posts and therefore convey the same amount of information as a blog. Having a following on Twitter is invaluable to your business. Think for a minute about how many customers are getting their information online. Here are 4 ways to grow a Twitter Following That Matters. By following other businesses you are not only engaging in good networking skills, but you are also exposing yourself to that business's customers. That business will see your tweets, and may even retweet your posts for their own customers, this great way to get yourself seen on the web. Not online are you getting along well with other businesses, but you are exposing yourself to potential customers. Chances are, your famous friends will not follow you back, but that's ok. Following famous people and organizations shows that you are interested in them. Their tweets will help you keep track of recent trends that could help your business to thrive as well. Also, if someone is following a famous person, they may look to see who else is following that famous person. Will they find your twitter? Possibly! Zinzz helps your twitter account to find new followers. That way your customers have an easy time finding you on Twitter. This way they do not have to manually search and find the "real" Twitter for your business. Also, it gives those who would not otherwise look for your twitter the idea to follow your Twitter. This is a new brainer. Do not write boring tweets or irrelevant tweets because people will not continue to follow you. They will also not retweet your tweets. When someone retweets your tweet, everyone who follows that person can see the tweet. That means your tweet is extremely exposed, but don't write boring tweets or they won't get retweeted. Twitter is a very valuable tool. People check their twitter multiple times a day. It is sometimes a better tool than even an email list. People will check their twitter for recent deals and trends etc. and find your deals and trends among the other tweets on their twitter feed. Remember, the object is to have exciting tweets that get re-tweeted which will broadcast your tweet to, possibly, thousands of people. This could be very good for your business. Twitter is the next big thing in eCommerce and regular face to face business alike. Next article: How Long Should An Article Be For SEO? Thanks for the list, Casey. I don't see how Zinzz can benefit us with Twitter, though. Unfortunately their web site give ZERO information what they are about. It's a recent trend with internet start-ups. They are too cool to put any basic information on their site. I wonder who would ever sign up to a service with no about page, no faq, no whatever?